With the basecoat completed, and the weather clearing up after some rain, the workers began the final stage of the stucco project. Prior to arriving in town the workers attached the rectangular frame for the sign as well as styrofoam trim around the second floor windows. 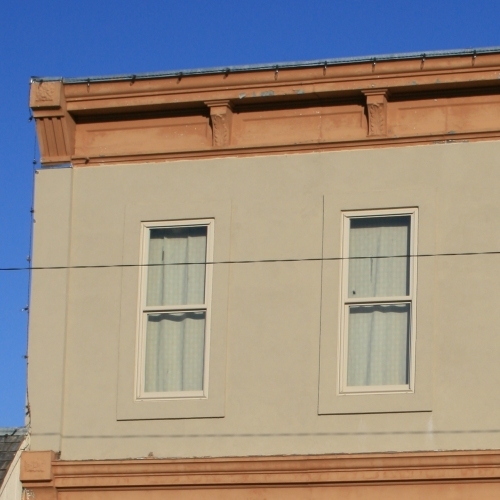 Our design plan was to try to suggest the original design on the second floor windows, which were trimmed with 1" X 6" stock. In the picture above the window color has been applied. 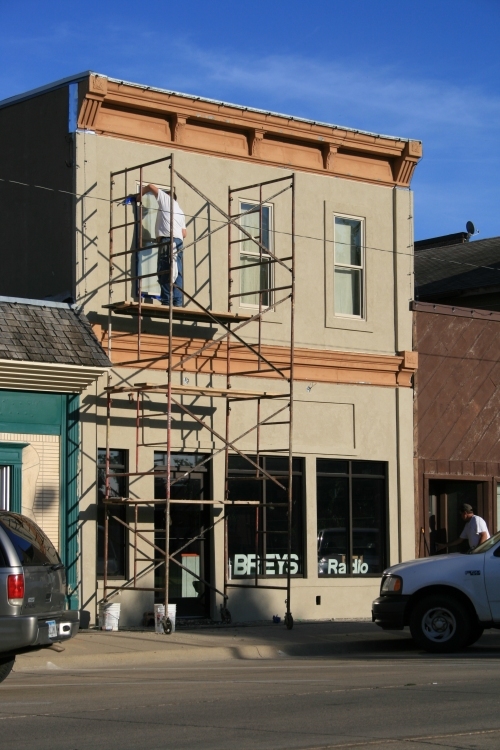 The workers ahd constructed the window and sign frames in the shop with styrofoam and covered them with basecoat and mesh. They applied them to the surface with flaps of mesh from the frame and then mudded them in place. I did not take any picturs of the color application since it is simply a trowel application and dificult to show detail. The color is a premixed product that is applied to the surface with a trowel. A second worker follows this with a plastic trowel and begins smoothing the suface in a circular pattern. The workers told me that the product contains particles that are sized according to the final finish texture and when applied correctly leaves a very uniform thickness of color and texture. We selected a color called Prairie Clay and a Sandblast finish. The final look was exactly what we had in mind. It would have been impossible to match the original stucco completely. 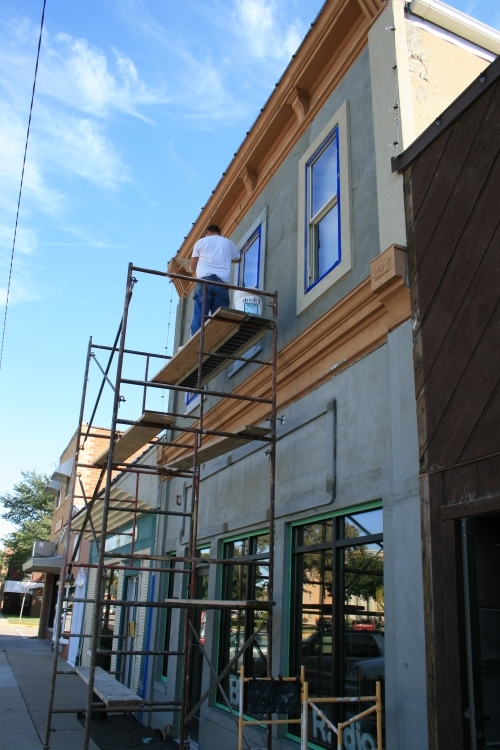 The oriiginal finish was natural colored stucco and of course nearly 100 years of weathering. But this color is close enough to blend well with the sides. It is very difficult to show the exact color and texture with a picture, but it is a fairly fine finish that should bring years of protection and beauty to the front.